The final Why This Book Should Win entry for today is from Katarzyna (Kasia) Bartoszyńska, an English professor at Monmouth College, a translator (from Polish to English), most recently of Zygmunt Bauman’s and Stanisław Obirek’s Of God and Man (Polity), and a former bookseller at the Seminary Co-op Bookstore in Chicago. 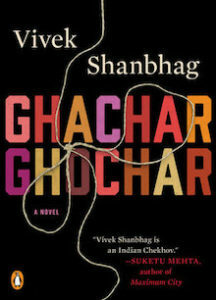 Ghachar Ghochar is a delightfully meandering, oblique little book. Nothing is what you expect: familiar themes surface, only to swerve unexpectedly and then fall away. The story jumps around in time and topic, disorientingly displacing your sympathies, inviting you to identify with the narrator, and then, suddenly, distancing you from him through the pointed critiques of his wife or sister, or his own self-doubts. A vague sense of tension and unease builds, drawing you further and further in: does it stem from the mounting conflict between the three women of the house? From the growing rift between the narrator and his wife? The never-explained break with a previous love interest? His sister’s increasing frustration with her life? The changes brought about by their newly acquired wealth? The strange woman who appears and tries to make a claim on his uncle, only to be brutally turned away? The lack of a clear source exacerbates the unnerving sense of something not quite right, a suspense papered over with proclamations of nostalgia for better days, when the family was poorer, but more tightly knit. Upon finishing the last few pages, one is immediately tempted to start from the beginning, to go back and try to pick up on all the hints that were surely there, unnoticed, the first time around, to chart a new course through the tantalizingly disparate material. Every piece feels crucial, but how, precisely, does it fit? I am making it seem like this is a mystery story, but what you’re actually reading is a series of reminiscences about home, family, work, that mostly seem typical, quotidian. There is no one deadly secret waiting to blow everything up. And yet, somehow, nothing is as it should be. The dense, brilliantly crafted (and masterfully translated!) novella only gains upon re-reading. This is the first of Shanbhag’s works to be translated from Kannada, and one can only hope that Srinath Perur will treat us to a few more.